Our marketing intern, Kyle, came in bright and early one Monday morning with a hunk of strange, twisted, and multi-colored plastic. Of course it begged the question—what in the world is that!? Kyle explained the humorous story of how this plastic hunk came to be. His college roommates had thrown a big party over the weekend and cleaned up really well after (or so he thought). In the midst of Kyle’s intense studying he got hungry and decided to make an oven-baked pizza, so naturally he preheated the oven. Once the oven was preheated Kyle opened the oven door to cook his pizza and instead found a mess of melted plastic—or party trash–covering the base of the oven. As it turns out, his roommates didn’t clean, they merely relocated the party trash to inside of the oven. Once the plastic cooled, Kyle removed it from the oven and brought it to work, because he knows how the Polymer Solutions team loves strange science moments. 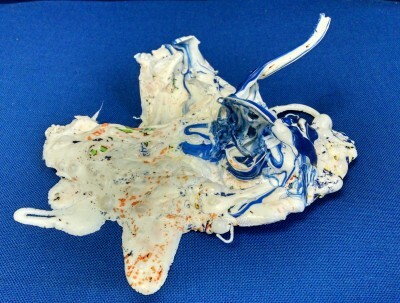 Our Marketing Intern removed this mangled piece of plastic from the bottom of his oven and learned a big lesson about plastics in the process! While we were marveling at this mess of twisted plastic our Founder and CEO walked in. In true Jim fashion he couldn’t pass up a prime teaching moment. He asked us, “Is it a thermoset or a thermoplastic?” So here you have it, a lesson in thermoplastics versus thermosets as explained by party trash! The differences in properties of thermosets and thermoplastics are a result of the chemical composition of the plastics. Thermosets are crosslinked polymers. To understand what it means to be crosslinked it may help to think about these polymers like a fishnet. It would not be possible to pull one strand out of a fishnet—there are too many connections in too many places to allow that to happen. A thermoset polymer is essentially one giant molecule because every molecular chain is connected to several other molecular chains. The only way to pull one strand out of the net, so to speak, is to damage the net. Conversely, you can imagine thermoplastics like strands of yarn tangled into a ball. It is possible to pull one strand of yarn out of the tangled ball and still have the strand remain intact. Thermoplastics are much easier to process and therefore lend themselves to a large variety of process methods. You can melt them into thin films, for example, or you can melt the material and then extrude it. Thermosets and thermoplastics both have value in their unique properties. Consider this; you would not want tires made from thermoplastics, on a hot summer day you may come outside to find the tires melted to the sidewalk. Thermosets are the necessary choice for applications that require high heat resistance. Thermoplastics though are much easier to process and are generally more environmentally friendly, as they can be melted down and easily recycled. When seeking analysis of a polymer material it matters greatly if a material is a thermoset or a thermoplastic. Thermoplastics can be melted and dissolved, which readily allows for a wide variety of testing capabilities. When it comes to the analysis of thermosets they can be more challenging (but you know how our scientists love a good challenge!) They are more difficult to analyze because the material is not meltable and not dissolvable which makes it hard to put into most instruments. However, our experts have work arounds to these challenges. 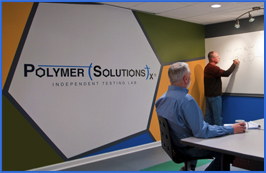 Common tests performed on thermosets by our scientists include, residual monomer, crosslink density, residual cure, gel content, and sol content. As it turned out, the classification of this mystery material was relatively easy to figure out once we had a good understanding of the differences between thermosets and thermoplastics. The party trash was without a doubt composed of thermoplastics. This situation proves the point; any moment can be a science-teaching moment!